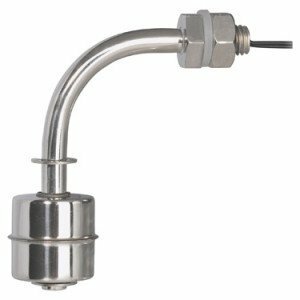 Level sensors have been widely used for a number of years within industry to detect the level of liquids and fluids. There is a variety of level sensor technology available including optical, capacitance, ultrasonic and float. 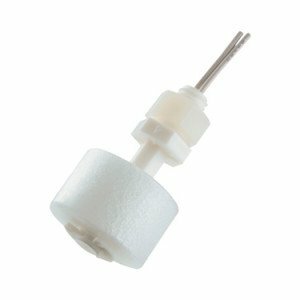 Alan Butcher Components supplies the magnetic float variety, also known as float switches. These are point-level sensors which determine whether a liquid is above or below a sensing point. 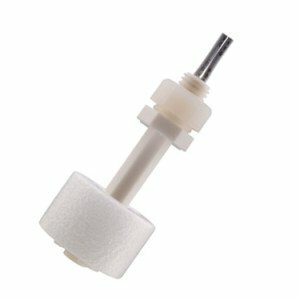 How do float level sensors work? 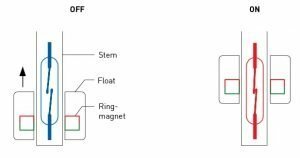 A float sensor is a non-contact switching technology which uses a reed switch and magnet to operate. 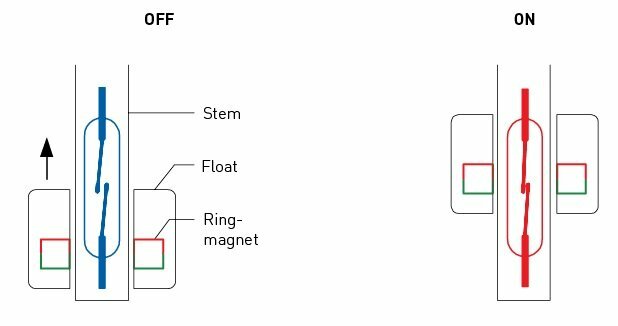 A reed switch is incorporated within the stem of the product and a magnet within an external float. The float moves up and down the stem as the liquid level inside a tank or container rises and falls. 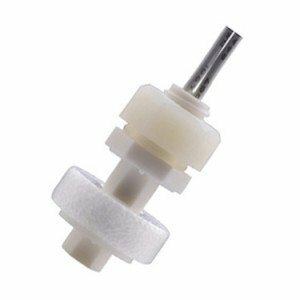 The magnet activates the reed switch as it passes turning an alarm, indicator, pump or motor on or off depending on the application. This type of design is relatively simple and well proven. It is also one of the most cost effective and offers long-term reliability. 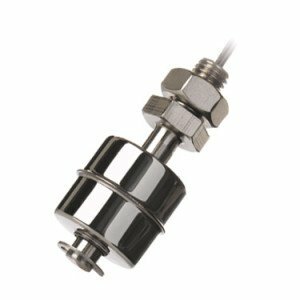 Liquid level sensors can be horizontally, vertically or side mounted. They can also be positioned at the top or bottom of the tank or fluid container. If mounted stem up, design engineers must note that operating functions are reversed. Typically, level sensors are either Form A or Form B. Float level sensors work well in a variety of media. 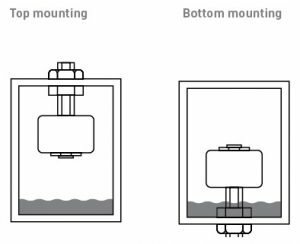 It is important to verify that the fluids the float switch will operate in are chemically compatible with the level sensor housing material. The following link provides a guide for the chemical compatibility of various housing materials – https://www.pic-gmbh.com/en/tech-center/housing-materials/application-notes/. It is essential that design engineers test the products prior to finalising their application to ensure the level sensor functions as required. Thick liquids or liquids that adhere to the float or stem are not suitable for float level sensors as they can interrupt the movement of the float up and down the stem. As mentioned previously, level sensor technology is widely used within a variety of industries including food and beverage, medical, printing, agriculture, automotive and domestic appliances for either leak detection or level measurement. Refrigerators – some modern refrigerators include automatic ice makers. 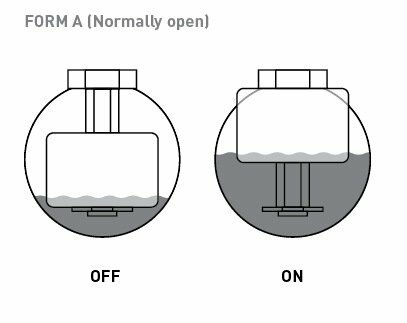 They need to have a water tank to make the ice and the level of water inside the tank can be checked with a float switch. If the water levels drops below a designated point a warning can be issued and the machine will stop producing ice. Condenser Tumble Dryers – A liquid level sensor inside the water container within the machine will monitor the water level. When the liquid reaches a certain level, the sensor will activate a pump to remove the water. Steamers – If the water level within a steamer drops below a certain level, a warning will be issued and the machine will no longer produce steam. This ensures that the internal workings of the steamer are not damaged through incorrect use. Industrial machines – tanks in industrial environments or machines contain operating fluids, lubricants and other crucial materials to ensure the machines operate correctly. The level of these materials can be detected using liquid level sensors. Alan Butcher Components supply level sensors manufactured by PIC GmbH. We stock their PLS range of level sensors and float switches. PIC stands for Proximity Instrumentation Controls Kontaktbauelemente GmbH. They are a medium-sized, international company based in Nuremburg, Germany. PIC has its own production facilities in Turkey and China. They have been producing high quality, competitive products for over 40 years. This level of expertise combined with flexible manufacturing facilities enables PIC to respond quickly and efficiently to customer enquiries. It also enables them to develop specific customer solutions for non-standard applications. Alan Butcher Components stock PIC’s PLS Series of level sensors and float switches. This range includes the PLS-020 which PIC brands as the smallest magnetic level sensor in the world. It is only 29.5x18mm and fitted with 300mm leads. 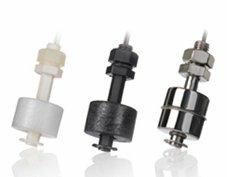 Liquid level sensors in Polypropylene, Polyamide and Stainless Steel housings are available in either Form A or Form B types. 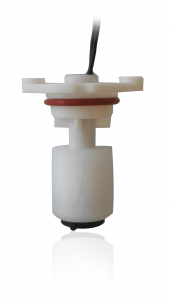 • Economical – Magnetic liquid level sensors are one of the most economical means of detecting fluid levels. 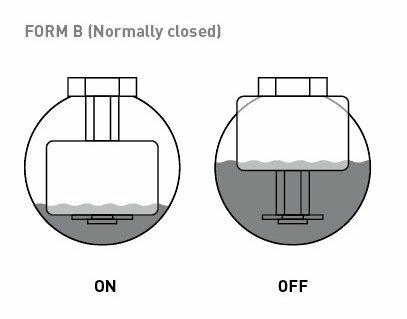 • No power supply required – the magnet within the float changes the state of the reed switch so there is no need for power. • IP67 rating for most products. • The majority of sensors are UL and CSA approved. • Customised versions available. Talk to us about the specifics of your application and we will try to find the most suitable product. • Type of liquid and therefore the sensor housing material. • Mounting – side, vertical or horizontal. Top or bottom of the tank. Alan Butcher Components is a UK distributor of electronic and electro-mechanical components. Our core product range includes switches, piezo buzzers, miniature speakers, microphones, IEC connectors, signal lamps & indictor lights, Berker socket outlets and switch systems.